Advanced GIF Antimator is a tool which provides you with the ability to create animated images which you may share on the web. Usage of this GIF animation tool involves only a few clicks and can create banners, buttons and random short animations without much effort. You may use many different types of graphics files such as those created in Photoshop or even Windows Paint. All you have to do is to combine them together and create an animated GIF file. 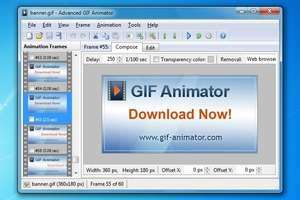 Advanced GIF Animator 4.7.14 is a shareware program and can be used as a demo to try the software until the free trial period has ended. A full version of the program is available after the trial period ends. For security reasons, you should also check out the Advanced GIF Animator download at LO4D.com which includes virus and malware tests. Additional screenshots of this application download may be available, too.